On the 20th of May, the Mayor attended the opening of six new homes at Littlebrook Manorway, Temple Hill. The event was organised by the Hyde Housing Association. At the event, Hyde's Development Director David Gannicott - along with the Dartford Borough Council Leader, Jeremy Kite cut the ribbon signifying the official opening of these new homes. On the 20th of May, the Mayor - along with the Mayoress - was also delighted to meet 21 members of the 8th Dartford Brownies. The Mayor met with the brownies at Fleet Estate, and thoroughly enjoyed meeting the young members of the Dartford community. The Mayor and Mayoress attended the opening of a new science facility - the Stephenson Building - at Dartford Grammar School on Wednesday the 21st of May. Elizabeth Truss MP, Under-Secretary of State for Education and Health Care also attended the opening. Also on the 21st, the Mayor attended the 'Adventure into Dementia' exhibition in Gravesend, where many organisations and groups met and discussed what they could offer to those suffering from dementia. Activities like these are very important for the people who need the charities. 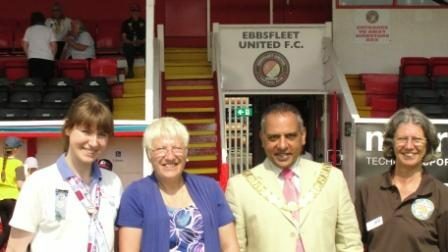 The Mayor attended the launch of wellbeing link on the 23rd of May. Wellbeing link is a community project meant to support people with life-affecting conditions, and the launch signifies the start of yet another project to help those who need it most. The Mayor visited Dartford Central Park on the 25th of May for the opening event that was taking place, and during his visit the Medway Concert Band performed at the park's bandstand. This was a great socialising opportunity for the Mayor, and he was able to just that at the event. The Kabbadi sports tournament took place later on during the day at the Gravesham Gravesend Guru Nanak Sikh Temple in Wolverhampton. While attending the tournament, the Mayor presented trophies to the contestants. On the 26th the Mayor attended the pre-launch party of a new American diner. The diner - called 'Richie's Diner' - is based in Green Street Green Road, in Darenth, Dartford. The diner offers a range of meals from burgers to brunch. On the 28th The Mayor attended the RNLI Lifeboat Station in Gravesend. While at the station, the Mayor was shown the full extent of how the station operates, including the areas they cover, the facilities available for the lifeboats and how the operators go about their job. 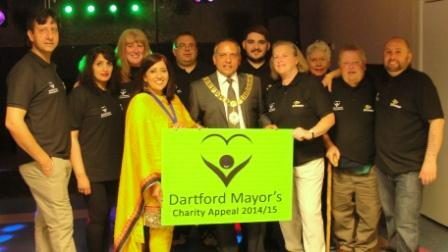 On Friday the 30th of May 2014, the Mayor held a Charity Curry Night at Amar Hall, East Hill in Dartford. The -15 tickets allowed guests to enjoy a night of an all-you-can-eat three-course meal, as well as entertainment. They raised a great deal of money during the event that will be going towards the Mayor's chosen charities.